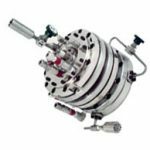 Direct Extraction Negative Ion Duoplasmatron - National Electrostatics Corp. 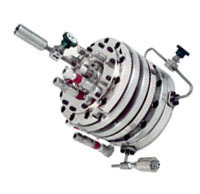 The NEC Direct Extraction Negative Ion Duoplasmatron Source (negative Duoplasmatron) is a displaced intermediate (Zwischen) electrode Duoplasmatron. The negative Duoplasmatron produces modest currents of negative ions from many molecular gases, including H–, O–, NH2–, CN–, and C–. It will also produce other ions from diatomic or molecular gases, which upon contact with a Duoplasmatron arc, have a good probability of breaking up into positive and negative ions. It will not produce currents of N– from N2 gas because of the instability of the N– ion nor can it produce negative ions from the atomic gases such as helium, argon, etc. Two versions of the negative Duoplasmatron source are available: simple and liquid cooled. The simple version has a permanent magnet to provide the magnetic field at the Zwischen tip. The liquid cooled version contains an electromagnet. 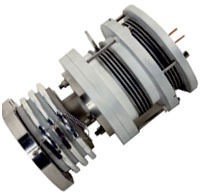 The source magnet coil of the liquid cooled version is insulated electrically from the magnet housing and is cooled by circulating coolant. The anode is also cooled. This allows for higher analyzed beam currents. Typical H– output for the simple negative Duoplasmatron is 5-10µA within the proper emittance 3 πmm mR (MeV)1/2 for efficient transmission through an accelerator system. The liquid cooled version can produce currents of up to 20µA H– with a standard aperture and filament.